The puff stitch is one of my favorite crochet stitches. 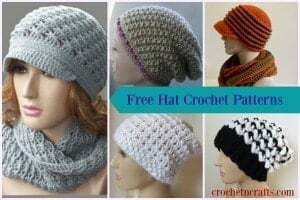 The texture that it creates is visible on both sides of the crocheted fabric, which means that it is the perfect stitch for scarves, afghans and other crochet designs where both sides will be shown off. Nevertheless, the puff stitch can be incorporated into almost any crochet design, including bags and purses, pillows, and other home decor. The thickness of the stitch makes it suitable for winter clothing and accessories. In addition, the thickness also makes it a great stitch for crocheting placemats or hotpads. And if you work it in fine thread, it looks quite lovely in doilies and other fancy lace work. The puff stitch is not difficult to make, but due to all the loops that get drawn up it can be a bit tricky if you are a beginner. Therefore, it is not recommended that you try it until you are comfortable with the basic crochet stitches. To make the stitch, wrap the yarn over the hook and insert it into the designated chain, stitch, space or loop. Wrap the yarn over again and pull it through. Keep pulling up on it until it matches the height of the other stitches in the row or round. You should have three loops on the hook at this point. Then simply repeat the process until you have anywhere from 5 to 9 loops on the hook. To close the stitch, wrap the yarn over the hook and pull it through all the loops on hook. Then chain one in order to secure the stitch. The beginning puff stitch can be started off with one to three chains. I find that starting it off with only one chain helps the stitch to blend in more with the others, but it results in a smaller stitch. Drawing up all those loops and working them as one stitch causes the stitch to take up a bit more room than other stitches. However, the stitch can still be worked into every stitch, chain or loop in each row or round. The stitches might appear a bit crowded depending on how many loops are drawn up as well as on the yarn, but it does look good in some patterns. The puff stitch looks nice when used in lacy designs with a crochet thread, but can be worked with any yarn that you like.